To celebrate the 75th anniversary of Gerhards – the Kitchen and Bath Store, owner First Supply recently hosted a design contest. Customers of the 13 design showroom stores in the Midwest were invited to submit projects completed with products purchased from the company. 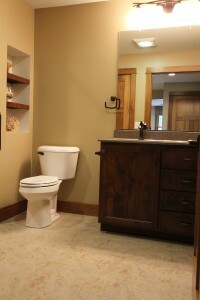 One of the contest winners, R. Tews Construction & Design, Inc., submitted a new home featuring Barrett style SmartHeight toilets in three bathrooms. Each elongated toilet bowl was ordered with a SmartClose seat lid.